Thirty years ago, few people could have imagined that downtown San Jose would be taking off like it is today. In the last year, 659 new units of housing came on the market and more than 1,900 are under construction. Over 5,000 more are approved or proposed. With almost two million square feet of commercial office space in the pipeline, even downtown’s commercial market is waking up. The two maps below show the dramatic uptick in development activity in just the last two years. Just two years ago, San Jose’s downtown wasn’t seeing a lot of real estate activity. Generally, San Jose’s housing market has been much stronger than the commercial market. However, today developers are proposing almost two million square feet of new office space in downtown. It’s the first time in many years that downtown has attracted substantial commercial investment. Many of the development opportunity sites that SPUR had identified in 2014 now have development proposals (yellow), approved proposals (purple) or are under construction (bright blue). What’s more, new buildings are coming in at high densities. Two-thirds of proposed developments are over 100 dwelling units per acre, and a large number of those are over 300 dwelling units per acre. New buildings are also connecting more effectively with streets, public spaces and each other than they have in the past. 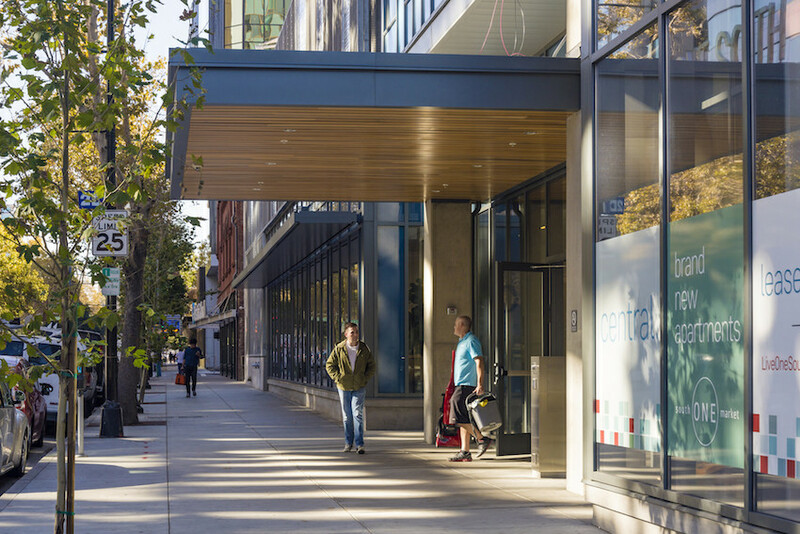 It takes considerable effort to create urban buildings with ground floors that are generous, active and welcoming — and newly completed buildings have done a good job of it. For example, One South Market puts the pedestrian entrance on a main street and provides a clearly defined and transparent streetwall, wide sidewalks and tall ground floor heights. Building better places at the human scale leads to more interesting and active sidewalks for people, which brings more restaurants and businesses — it’s a virtuous cycle​. While it has long had the South Bay’s largest concentration of social, cultural and entertainment activities, downtown San Jose finally seems to be benefitting from the growing trend toward working and living in urban centers. This is what a generation of city leaders has been working toward, and the excitement is both palpable and well deserved. But it’s also fragile. The nature of booms is cyclical. There’s a chance that some of the proposed projects will not get built. The city’s successful high-rise incentive program, which cuts construction taxes in half, expires at the end of this summer. This could increase development costs. Meanwhile, the price of land is rising: This year, the sale of the development site across from City Hall broke records at $207 per square foot. If costs climb too high, development may become too risky. In addition, there are some signs that the Bay Area’s red-hot economy is starting to cool off, which could slow downtown’s transformation. Downtown’s zoning permits both commercial and residential development. This makes downtown one of the few places in the city where residential development can occur at any time. 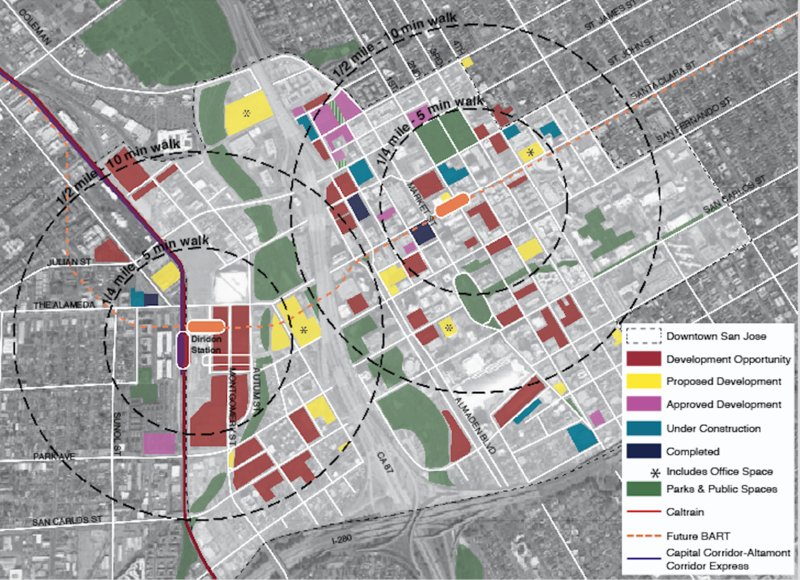 The Downtown Core zoning is permissive not only as to use but also regarding the intensity of development. There are no minimum density requirements and it has a maximum floor-area-ratio of 30. On one hand, this brings lots of new housing, people and energy to downtown. But the city has recently increased the number of jobs it’s planning for in downtown from 48,500 to 58,500, and it plans to increase the number of housing units from 10,360 to 14,360. Will there be enough room for all of them? Assuming that every employee needs about 200 square feet of space, we calculate that downtown will need 11.7 million square feet of new commercial development to accommodate 58,500 jobs. In our maps above, and in our report The Future of Downtown San Jose, we speculated that there would not be enough room — even for 48,500 jobs. However, we are only counting vacant lots and surface parking lots. While new research shows that downtown has only 5 acres of vacant commercial land left, there are also dozens of underutilized sites that could be redeveloped for jobs — if the market is willing to do so. 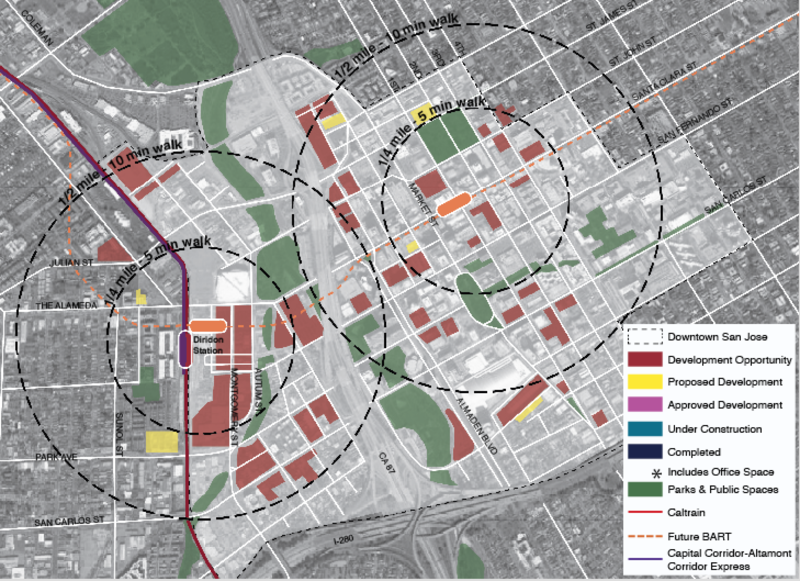 How can San Jose get the downtown it hopes for? So far San Jose’s strategy has focused on creating attractive conditions for investors — and it’s worked. But while the market is still hot, now is a good time to consider some changes that will make it possible for the city to achieve its goals for downtown in the long run. It’s great that developers have proposed 2 million square feet of new commercial space, but the city still wants to accommodate 9.7 million more. To get both lots of jobs and lots of housing into downtown’s small footprint, it will be essential to maximize every site that gets built. To maximize each site, the city could eliminate minimum requirements for parking spaces and let the market drive the parking supply. However, the median parking ratio per unit is 1.26 for developments that are currently under construction — actually higher than the 1 per unit that the city requires for multifamily housing in downtown. It might be a good time to start exploring how to manage parking on a district scale, or even think about setting parking maximums. Otherwise, developers may continue to build to today’s market expectations and lock in today’s development patterns and travel behaviors — something that could undercut the major transit investments coming to downtown, such as BART and high-speed rail. Successful adoption of the county transportation sales tax in November could provide a level of certainty to developers and employers that downtown will have excellent transit, allowing them to confidently lower parking supply. At the same time, it is important to make sure that each development adds up to a great urban place. Codified urban design rules give the market confidence that such a place will emerge. While recent buildings have demonstrated better urban design, there is no certainty that every building will support the active, walkable downtown that San Jose hopes to achieve. Where design policies exist, they are guidelines, not codes, which means they are aspirational and largely unenforceable. Clear, binding codes can produce a level of certainty about the length of the entitlement process and help build investor confidence that others will follow suit to create great places. 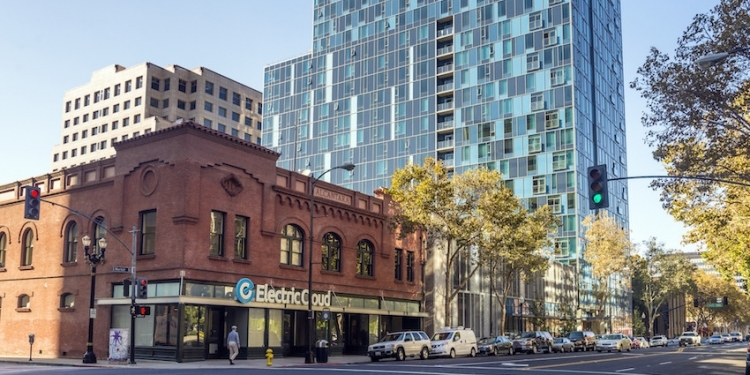 Downtown San Jose is changing rapidly, and its success will lay the foundation for the rest of the city to become more urban and more connected to the rest of the Bay Area. Achieving this vision is far from assured and will require putting policies in place that support its transformation.